The Feitian Multipass and ePass FIDO 2-in-1 Bundle contains one Feitian ePass FIDO-NFC and one Feitian MultiPass FIDO Security Key with recharge cable. 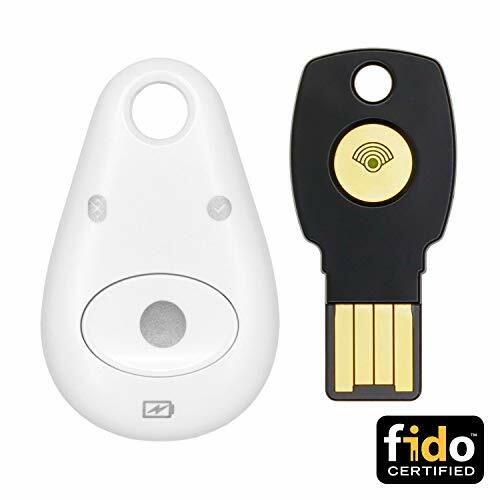 Feitian ePass FIDO-NFC is a FIDO alliance certified U2F security key. Unlike the traditional second factor authenticators, FIDO U2F provides a much convenient solution to replace or be a plus of traditional password. Each FIDO device is able to store multiple key pairs. Feitian ePass FIDO-NFC embedded NFC module into its key-liked compact body. Users are able to use the ePass FIDO-NFC for registration and authentication with their Mobile phones or other devices with NFC sensor. ePass FIDO-NFC will be a considerate partner for those who have both security and convenience requirements. Feitian MultiPass FIDO Security Key is a device to go beyond the traditional two-factor authentication systems, the built-in three communication interfaces (BLE, NFC, and USB) empower user to select the desired channel and complete a secure FIDO U2F authentication across any of your client devices in contact or wirelessly, including desktop, notebook, tablet, and smartphone. * The security key can only be added to Google account on non-mobile platform with latest version of Chrome. ** After the key added to the Google account, iOS user may use Google Smart Lock application (https://itunes.apple.com/us/app/google-smart-lock/id1152066360?mt=8) to pairing their BLE keys. *** User may check Google support (https://support.google.com/accounts/answer/6103523) or User Manual (http://download.ftsafe.com/files/FIDO/Manual/ePass%20FIDO-Multi-Interface%20Manual.PDF) for detailed guidance. If you have any questions about this product by Feitian, contact us by completing and submitting the form below. If you are looking for a specif part number, please include it with your message.